Huge range of features, great value for money. Simple effects controls do limit combinations. Packed with features and high build quality, this amp is a great example of “bang for buck”. 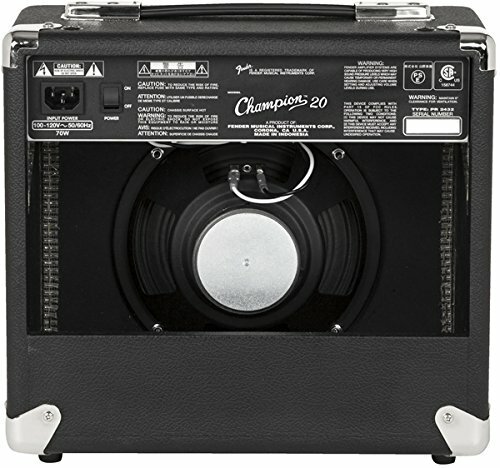 he Fender Champion 20 watt guitar amp is an extremely popular small practice amp. 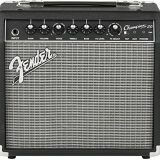 Whilst some other amps in this price range offer bare bones features and 10 watts, the Fender Champion 20 watt offers on board effects, amp modelling and an iconic brand. Let’s check it out. Wow. Just WOW. You have to admit, for an amp in this price range, that is a phenomenal amount of technology and features at your fingertips. The dials work really well in allowing you to move between tones. 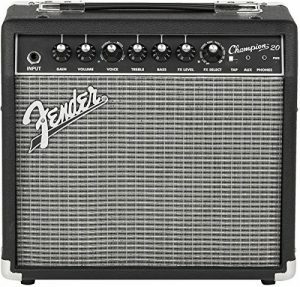 One of the most unique and compelling features of the Fender Champion 20 is the amp voicing. The “Voice” dial has 4 zones. Tweed, Blackface, British and Metal. Whilst there are 4 options, you can actually move the dial through these zones and boost the particular voice. This amounts to what Fender claims to be 12 amp voices. There is a light that alternates between green and red, just next to this control. That helps to identify when each of the voices is activated in each zone. For those unaware of the terms Fender uses, here’s a bit of a rundown on the individual amp voices. Tweed – refers to the Fender tones from the 40’s to the early 60’s. A famous era where Fender made a name for great amps that had a beautiful clean tone, able to be beefed up with a “crunch” that was heard in so many of the tracks of that era. Some of the most famous “tweed” amps include the Bassman, the Princeton and the Twin Deluxe. Blackface – Following the tweed amp, Fender introduced a new style of amp, featuring black “hat shaped” controls and black tolex (vinyl). This era saw new circuity and the aesthetics that are still seen today. British – This is Fender’s way of offering other tones offered elsewhere from the likes of Vox. This allows you to cover both the American and British tones, meaning you can get a massive range of voices for your playing. Metal – Opting for the Metal voice brings in much more gain and whilst it might not be the major strength of this amp, it’s more than acceptable as a metal tone. Some people love modelling amps with onboard effects, some don’t. Let’s put that debate aside for the moment, and just assess what the quality of the tone is from this Fender. Personally, I was pretty surprised at the sheer volume of tones you can get from this amp. It’s like having a multi-effects unit at your fingertips (like the Zoom G3X). I found the tones to be fantastic for the purposes that this amp is intended. When you consider that this amp is unlikely to be mic’d up and used in a concert hall – or to record an album – then you look at the tones in a different light. They’re great! For new musicians, or for small scale practice, there are dozens of tones to be found. It’s so fun to work through the amp voices and on-board effects. I found that each time I went to a new tone, it would remind me of a song I know, so I’d play that. The Tweed and Blackface tones are my favourite, especially with a little gain and some reverb added in. Due to the small size of the cabinet, any high gain sound is going to struggle to obtain a lot of depth. So taking that into account, the Metal tones were fine, but don’t compare to something like a Blackstar HT5R, as the price comparison means that it’s an unfair comparison. The effects control works much in the same way as the amp voices. You move the dial through the settings and the tone will get more of the effect as you do so. The tremelo and delay effects can be set by the “tap” button. Just tap it to the tempo you want, and the timing sets accordingly. It’s super simple. The Wah effect was probably my least favourite, though I’m a little prejudiced…I really can’t stand auto-wah effects. One gripe that some players might have is that the effects are grouped in a way where you can’t engage some effects simultaneously. For example, you can’t have chorus and flanger on together, not that you’d necessarily want to, but it’s still a restriction. However, Fender obviously wanted to keep things simple, so they researched what effects players like to group together and just merged them on the amp. I’d have liked a pure reverb by itself, but you can’t have everything. 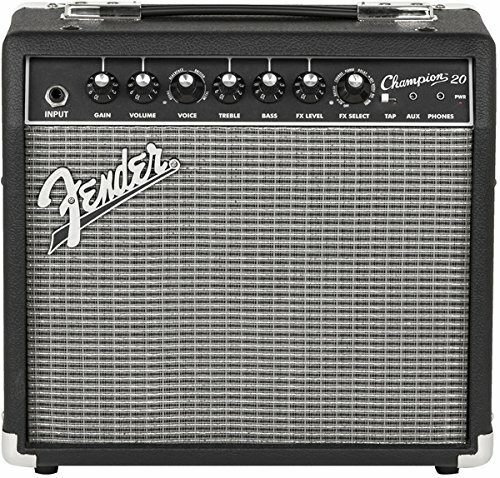 For an amp of this price, the Fender Champion 20 watt offers a massive amount of value. Good power, on board effects, amp voicing, headphones, aux in! Seriously, it’s a hard to beat offering from the Fender shop.